Discovering, experiencing, reflection and debate, through the path of a circuit Jewish city tour of Rio de Janeiro on various aspects related to Jewish history and culture of the city, its community and its leading personalities and interaction between this diasporic community, Brazil and the State of Israel and Zionism. What are we going to visit on this Jewish City Tour? 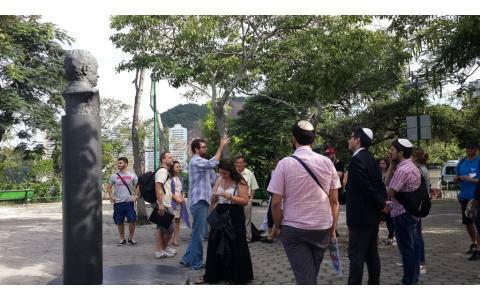 During the tour, travelers will visit places, streets, buildings, landscapes, learn about the great history of politics, power and society, hear stories of people who were and are protagonists of the Jewish experience in Rio de Janeiro. 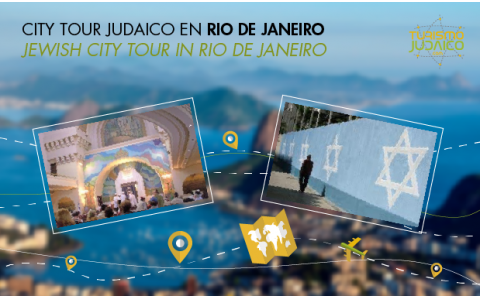 The itinerary it's a mix itinerary with an historical perspective on Jewish immigration to Brazil, and also to learn about the current Jewish life in the city of Rio de Janeiro. * Ari Synagogue Ari, in Botafogo. * Praza Maua: Always cosmopolitan. Maua Square has many symbolic elements that mark the history of the Marvelous City progress and also some stories about slavery. * Great Temple of Rio de Janeiro, a beautiful building from 1932. * The Cultural Center Midrash of the Rabbi Nilton Bonder. 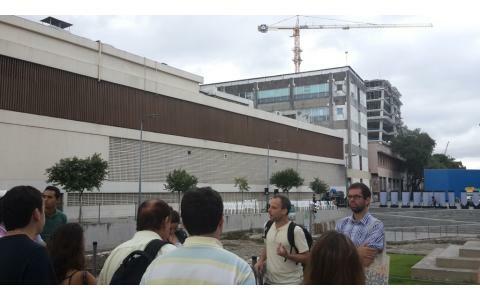 * In Copacabana visit the Club Israelita Brasileiro and the Synagogue Beth El. 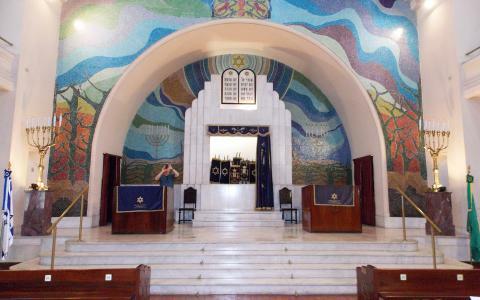 * The Synagogue Shel Gmelut Hassadim (in Judeo-Spanish Sephardic rite), which has received the visit of Emperor Dom Pedro II, located in Botafogo. Note: Synagogues and sites visited can change according to customer request and / or availability of institutions. The entrance to institutions is subject to availability and institutional confirmation. Frequency: Every day except Saturday. ** Sundays with exception, knowing that several institutions are closed for inside visits. Duration: 4 hours. In the morning or afternoon. Includes: Bilingual guide and transportation. Pick up and drop off from passengers hotels or cruise port. Not included: Food and Tzedakah in Jewish sites. Optional: Lunch Kosher available upon request. The second largest Jewish community in Brazil began to form in the mid-nineteenth century. With the proclamation of independence in 1822 and the relative religious freedom established by the Constitution of 1824, he took home the arrival of Jews to the then capital of the country. Before that period, between the sixteenth and eighteenth centuries, there was a significant presence of New Christians in Rio de Janeiro, as well as persecution by the Inquisition. In the early twentieth century, a period of intense institutional and community development all starts, leaving an indelible mark on the city center and in the memory of the thousands of Jews who lived in the vicinity of the Praca Onze, which in addition to hosting immigrants of Jewish origin, it is considered the birthplace of samba and is one of the inescapable references of the "Little Africa." "The guide was great, She is smart and a lady. I enjoyed a lot the Jewish tour in Rio. Thank's Judaic Tourism!" "We're back from our tour. We learned so much about the Jewish community of Rio. The guide was a wonderful,knowledgable guide. I'll give your name to my travel agent. Thanks so much for making all the arrangements." "Everything very well. They complied with everything we hire. The guide picked up us from the port, he was great. Thanks for this service."